Some of you may be wondering why Bill & Dave are doing a hike in the middle of a large city. Have they gone citified? Hardly! Well, then, what does this have to do with us in Sonoma County? There are some hiking related connections between Sonoma County and San Francisco. One tie-in is the Bay Area Ridge Trail, the planned 500 mile trail loop around the bay. About 300 miles of this trail has been completed. Some of it will be routed through Sonoma County and some of that is already completed. 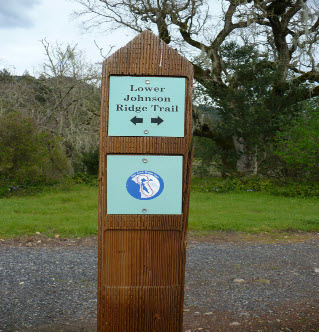 There are Ridge Trail signs along trails off of Pythian Road. (As a side note, Santa Rosa has the distinction of being the northern most point of the Ridge Trail.) The connection here is that the Bay Ridge Trail runs through San Francisco. In fact there is a sign, one of several in the city, stating this just a few blocks from the bottom of the Pemberton Stairway, a point on our route of our first walk. Another connection is Bald Mountain in Sugar Loaf Ridge State Park. Bill states on a clear day he can see Sutro Tower from the top of Bald Mountain. Sutro Tower is adjacent to Twin Peaks. On our pre-hike of S.F. 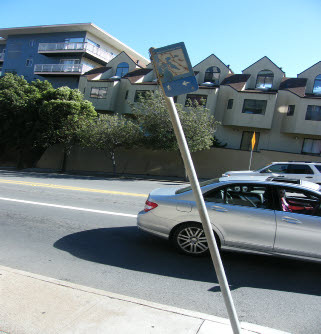 Walk No. 1, Bill shared his binoculars with Dave and Mike Noel at the Twin Peaks lookout. They were trying to reverse the process; that is they attempted to spot Bald Mountain from Twin peaks. They had spotted several candidates and had a lively discussion among themselves as to which one might be Bald Mountain. At one point one of them (only half jokingly) commented they should call Sandy Larsen and have him run out to Bald Mountain with some signal Flags.